While trains are generally considered a safe mode of transportation, accidents can and do happen, and when they do the injuries are often very serious. When a traincar derails, the passengers on board can be seriously injured or killed. If a railcar collides with a large semi truck at a railroad crossing, passengers may be seriously injured and the driver of the truck may be killed on impact. Railroad accidents can happen as the result of engineer or operator negligence, defective rails, faulty railroad crossing signals, or negligent maintenance of railroad tracks. If you or a loved one has been injured in a train accident, or if you have lost a loved one as the result of a railroad crash, you’ll need the help of a train crash lawyer to help you and your family obtain necessary medical treatment or financial compensation for the loss of a family member. 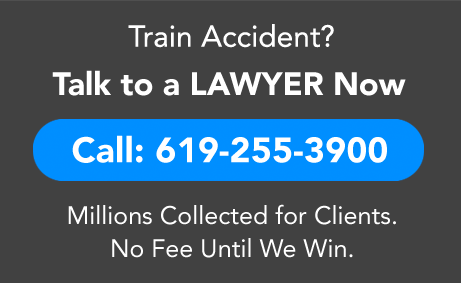 You’ll want a dedicated train accident attorney who is driven and capable to prove the cause of the train accident so that you can obtain justice and financial compensation for your injuries or loss. If you are in search of the most dedicated train crash lawyer California can offer, you have come to the right firm. Our expert lawyers will aggressively pursue investigation of a railroad crash in order to nail down the causes of the train accident, hence building up a strong case that will have the best chance of resulting in justice and the maximum financial recovery possible. Our professional train accident attorneys are committed to helping your family recover from the physical and emotional trauma of a train crash. If you have been involved in a railroad accident, the train crash lawyers at Injury Law Group will fight to ensure that your family’s legal rights are fully protected and that you receive the maximum compensation available from the train operator or other negligence persons who caused the railroad crash. When you retain the help of our firm, our California train accident lawyers, will make sure that you receive proper medical treatment and that all of your medical bills are fully paid for. While you are recovering, we will be fighting hard for your legal rights and obtaining just compensation for your injuries. If you have lost a loved one as the result of a train crash, we’ll make sure that your funeral costs and expense are paid for and fight to obtain the maximum monetary recovery possible for your pain and suffering, lost wages, and loss of companionship. We’ll fight hard for you, while you focus on recovery. Under California personal injury law, if your family member was killed in a railroad crash, you and your family are entitled to monetary compensation for your loss of companionship. The law places a monetary value on the companionship that you enjoyed with your loved one who has passed on, an experienced personal injury attorney will be able to obtain a monetary award for you on that basis. When a crash occurs, prompt investigation is key. Your train crash lawyer must immediately send its investigator out to the scene of the accident to independently access and determine the causes of the train accident. The Federal Railroad Administration (FRA), which is an arm of the United States Department of Transportation, will investigate the cause of a crash, and inexperienced attorneys will simply wait for the FRA to complete its investigation and base their client’s case on those results. However, a dedicated train crash attorney will immediately make its own assessment and perform its own investigation, in order to discover additional evidence that could potentially help you and your loved ones obtain justice. Failure to follow FRA regulations and safety rules points to negligence on the part of the train engineer or trail operators, or other parties who did not comply with the applicable FRA rules and regulations. When a train accident occurs, the FRA will investigate the accident, and, frequently find a violation of FRA safety regulations. Even if the FRA does not find a safety violation, a California train crash lawyer can perform an independent investigation that may lead to discovery of an FRA regulation violation. Such a high level of dedication shows our sincere level of commitment to protecting your family and helping you obtain justice. Contact Injury Law Group today and speak to a train crash lawyer California. We are dedicated California railroad accident attorneys. We’ll fight hard to obtain justice and financial compensation for you, so that you and your loved ones can focus on recovery. Call us now at 619-255-3900.